For several years now I have been angry with myself and with my fellow humans. We don’t have what it takes to address the critical issues we face with each other and with the species with whom we share a planet. The U.S. Coast Guard has a reporting system for chemical, solid waste, and oil spills called the National Response Center—a 911-call center for our waterways. Looking at the Center’s reports, there are enough incidents in a year to fill any map, and these are just the ones that get reported. Even with the Clean Water Act in place since 1972, we continue to dirty our water. If we look back another hundred years or so, our waterways, and in particular, the Ohio and Mississippi rivers, were sullied by pollution of another kind: human trafficking. To this day, “sold down the river,” implies forcible separation from family, certain hardship, and even death. Water is indeed a vehicle for slavery while the converse, “up the river,” translates into being shipped off to prison. During my childhood, Mohammed Ali was the subject of many impassioned conversations in my suburban New Jersey home, as my father greatly admired his integrity and the guts it took for him to object to being drafted into the Vietnam War. Furthermore, one of Ali’s urban legends caught my attention. Shortly after returning home to Louisville, Kentucky with a 1960 Olympic Gold Medal, despite parades and fanfare, Ali was refused service at a local drugstore counter. A white motorcycle gang chased him and a friend out of the store and onto the road. The story concludes with Ali throwing his beloved medal into the Ohio River in disgust. It just so happens that 1960 was also the year my parents married. My Italian father from Brooklyn barely “passed” for white with his father-in-law who was from Georgia. Nothing about race was clear, except that Ali and Huck Finn’s voices started to shape my worldview. That was very clear. Today I study databases and the news as much, if not more, than paintings in museums. A glance at Google Maps tells me that Ferguson, MO is not far from the Mississippi. I have the tools to map out toxic dumping on riverfronts—and to illustrate how the senseless deaths of young black men geographically and historically connect with the United State’s slave trade. This is not a graceful narrative; it’s a combination of things, 1-2-3, which are happening in my world at this time. This is my America. Carolyn Speranza with Lisa Link on Skype present “End of the Line” at the Carnegie Library. 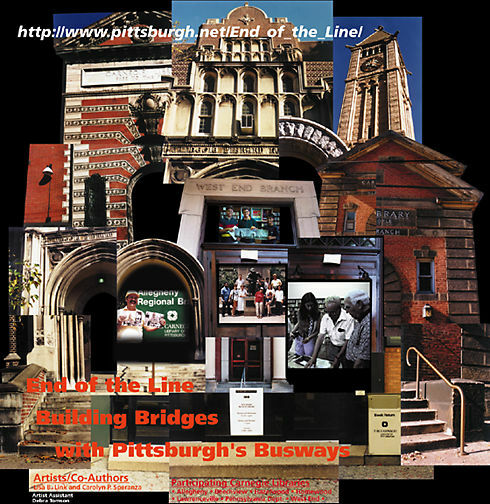 Earlier this fall, in October, Lisa Link and I presented End of the Line: Building Bridges with Pittsburgh’s Busways, a temporary public art project at Spark’s Lunch n Learn at the Carnegie Library. At the core of the project was our digital art and community research workshops at Carnegie Branch Libraries. 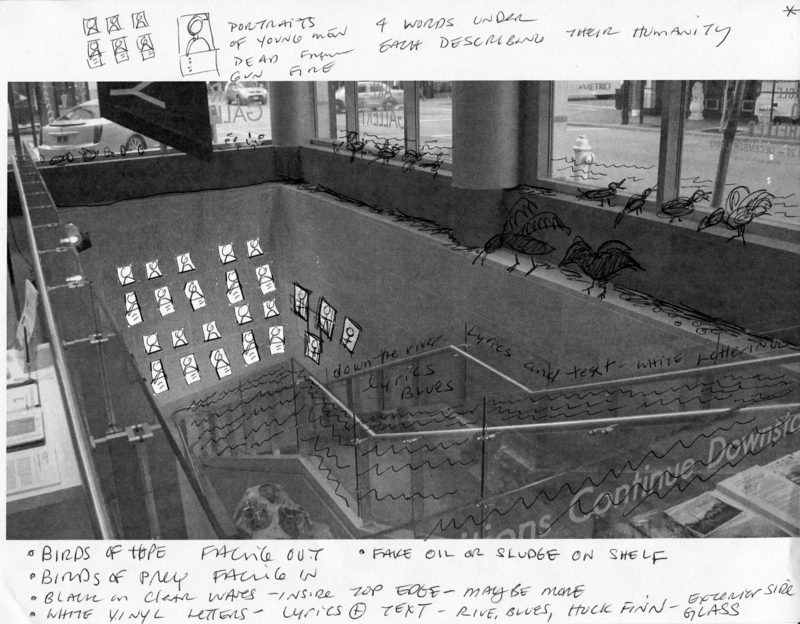 The type of work we were doing in 1996-7 had not been done before in Pittsburgh; certainly not as a key component of a public art project. In our presentation we looked at End of the Line from the lens of the libraries’ recent shift to digital labs. We used the decentralized network of Carnegie Libraries as a structure for engaging residents in these neighborhood hubs. Coming from the STUDIO for Creative Inquiry, we had a research orientation towards working with project participants. We came to library workshops to conduct oral histories, to gather and copy personal and historic photographs, and to begin conversations about what mattered to people – their concerns, issues, hopes and dreams for the future of their communities. None of the hand-held technologies that we currently take for granted existed at the time. Our only hand-held was a Sony Walkman. We worked with desktops, not laptops. From the libraries we came back to the STUDIO having successfully conducted our community research. We set about analyzing materials and quickly saw four themes emerging for the design of bus billboards. In order to include everyone’s participation on the project, we created an online archive, using the 1997 Frames technology of WEB 1.0. Here you can see one of the twenty Port Authority buses we used to transport the project. Inside the bus, Lisa and I are seated by one of the interior posters celebrating the libraries’ key role. In the bus, we are talking to Ruth Rosfeld’s daughter. Ruth was featured in our “neighborhood hero” themed bus billboard design. She is from Beechwood, and you can just see the Beechwood librarian in the background of the photograph. You can find the original End of the Line web site here and a photo album with complete documentation here. At Spark’s Lunch n Learn we had a packed house of educators, library professionals and community leaders.